Forums » Professional Video Editing & Finishing Forums » Avid Media Composer - PC » Source Browser shows “Last Modified” aka Date of Shoot...? Latest post Tue, Jan 1 2019 3:07 AM by DStone. 4 replies. 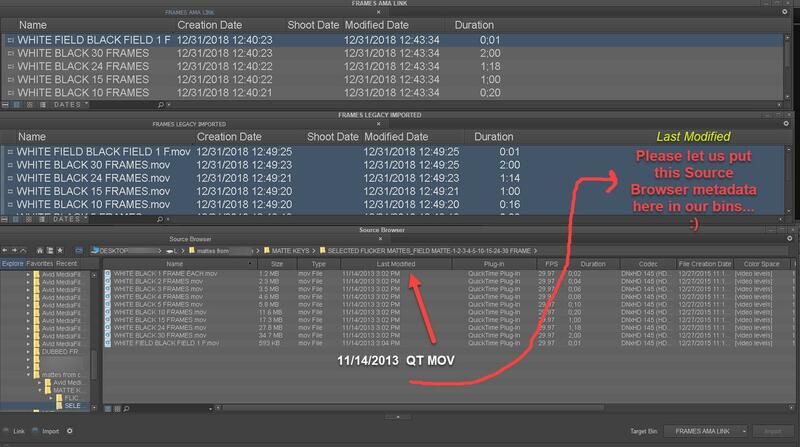 Source Browser shows “Last Modified” aka Date of Shoot...? Inside MC, I could use the metadata that resides on my original, legacy-Imported files: The Date it was shot,pre-import into MC (not the MXF MC Creation Date). I just noticed that Source Browser shows both dates, which is very handy if the file itself is AWOL, not on the system and I want to re-import or Link. Can we somehow copy that “Last Midified” metadata into a Bin column displaying previously Imported files? Sorry, I made a mistake. Forget my comment. Metadata support is somewhat lacking in MC. It all depends on what populates the metadata fields, and that's generally the plugin which links/imports the data (including whatever native ingesters are built into MC). For example, if I use MediaInfo on my XAVC-S clips, it shows me the the shoot date encoded in the metadata. This does not get populated by the Avid generic plug-in (I don't have the Nablet XAVC-S plug-in for comparison). So it's possible, but not implemented (at least not for the plug-ins that I have available which I normally use). My minor discovery, I think, was that we can look up a non-supported plug-in's original date, the same one that is shown at the PC finder level. OK, I see what you mean. The Last Modified date in the source browser matches the shoot date in my XAVC-S as well. So the plug-in sees the metadata, and simply isn't populating it. There's a good feature request (actually I'd like the option to have it set the Shoot Date field instead of the Last Modified date, as it's really what the metadata is about).